I watched a British-made film a while back, one of many being shown in the run-up to the Oscars. It was Brief Encounter, a 1945, black-and-white film about a man and a woman—both married to other people–who meet by accident and fall desperately in love. 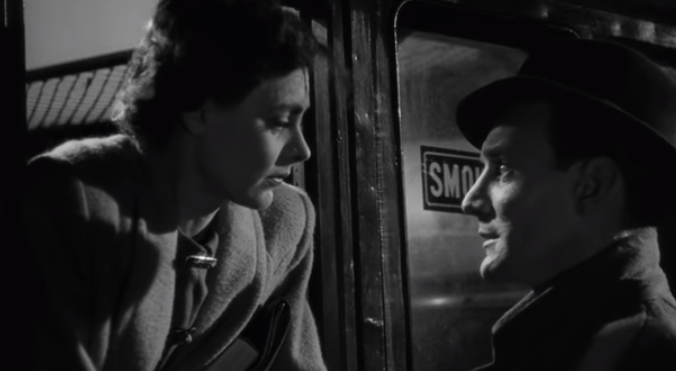 The British Film Institute voted Brief Encounter, directed by David Lean, the second-greatest British film of all time—something cynical me found astonishing. Why? Because the couple’s love affair is never consummated. The film opens in a railway station refreshment room in northern England, where we see middle-class housewife Laura Jesson (Celia Johnson) and Dr. Alec Harvey (Trevor Howard), seated at a table, looking miserable, while railway employees cheerfully chatter away. That evening, at home with her family, Laura imagines she is confessing to her husband what she has been up to during the past six weeks. Through Laura’s voice-over narration, we learn that every Thursday, Dr. Harvey travels to a nearby town to do his hospital rounds. Laura takes a train to the same town, also on Thursdays, to shop, change her library book, and see a matinee. It’s part of the quiet routine of her life—until the day she first encounters Alec in the railway refreshment room, where they are waiting for their respective trains home. A bit of grit has blown into Laura’s eye, and Alec helpfully removes it. The following Thursday, they bump into each other on the sidewalk, and talk briefly before going their separate ways. An emergency at the hospital keeps Alec from their next planned rendezvous. He catches Laura as she is about to board her train home, and the two agree to meet again the following Thursday. “Yes—yes, I do,” Laura replies softly. They have fallen in love. And already, Laura is consumed by guilt, determined to resist the impulse to act on her feelings. Alec seems reluctant to accept this, and he impulsively kisses her goodbye. When Laura gets home, she lies to her husband for the first time about where she’s been and with whom. More guilt, more shame. Nevertheless, Laura turns up again the following Thursday. The two enjoy a merry champagne lunch until a horrified Laura spots two acquaintances who have been watching them drink and flirt. It spoils their afternoon drive in the country, and Laura confesses that she is unhappy. “Something like that,” Laura responds. When Alec catches up with her at the train station, he tries to calm her down. “We know we really love each other. That’s all that really matters,” he insists. The couple decide to meet once more, and then part forever. Alex will accept a job offer in South Africa, which will eliminate all future temptation. They will not even write to one another. Alec and Laura spend their final Thursday driving through the countryside again, and say a final goodbye at the train station before their trains roar off, taking them home to their families. Pardon me a moment while I wring out my handkerchief. Brief Encounter really is a terrific film. It garnered three Academy Award nominations, including Best Actress and Best Director nominations for Celia Johnson and David Lean. The film’s lush, romantic score—Rachmaninoff’s piano concerto 2—perfectly sets off the drama. So—great acting, beautiful music, and an original, complex plot. Of course, lots of films have these things. What makes this one so special that, 74 years after its release, film experts still consider Brief Encounter such a triumph? I think it’s because the film has a certain nobility about it. Yes, Alec and Laura briefly consider consummating their affair. But they never appear to consider, even for a moment, divorcing their spouses and breaking up their families. It’s not simply because doing so would damage their own happiness, as well as that of others; it’s because doing so would be wrong. Alec and Laura’s decisions are undergirded by biblical teachings that had sunk deep into their culture. They recognize and accept that marriage is intended to bind couples together in monogamous unions for life, in part because children are so vulnerable. The film also is truthful. There’s no nonsense about it being brave and noble to abandon a spouse for one’s “true love” (as we see, for example, in films like Dr. Zhivago and Anna Karenina.) Besides, these days, too many people have grown up in broken homes to think a cinematic love affair that ultimately destroys two families is “romantic.” The best films reveal truth—not what we want to be true. Laura understands this from the beginning. What does not occur to her is that each time she succumbs to the temptation to see Alec again, she is making it harder to break things off, as she knows she must if she is not to destroy her life. And yet, she keeps going back for another helping of illicit love. If the meetings had continued much longer, they would likely have succumbed to adultery. Alec and Laura are ordinary, middle-aged, people living quiet, middle-class lives. Brief Encounter offers a warning that even ordinary, happily-married people can unexpectedly fall in love with someone else. The question is, how will we react if this happens to us? Anne Morse spent 17 years writing and editing BreakPoint radio scripts for Chuck Colson, and is the author or editor of several books. She lives in Maryland with her husband. Has the Church Done More Harm Than Good?